The other day I was working on my demo of Oracle Process Cloud Service (PCS) for UKOUG Apps 2016. After creating the application, I wanted to start working on the process. My use case fits an out of the box pattern nicely, so I started with "Form Approval with Integration Pattern" and PCS created a default process for me; with two swimlanes and a number of activities. The resulting process is shown below. Process created based on "Form Approval with Integration Pattern"
Process Owner. Users with this role have access to process activity history, can take actions, alter the process flow etc. Process owners typically manage deployed business processes and use metric analysis tools such as dashboards to monitor the business process. Process Reviewer. 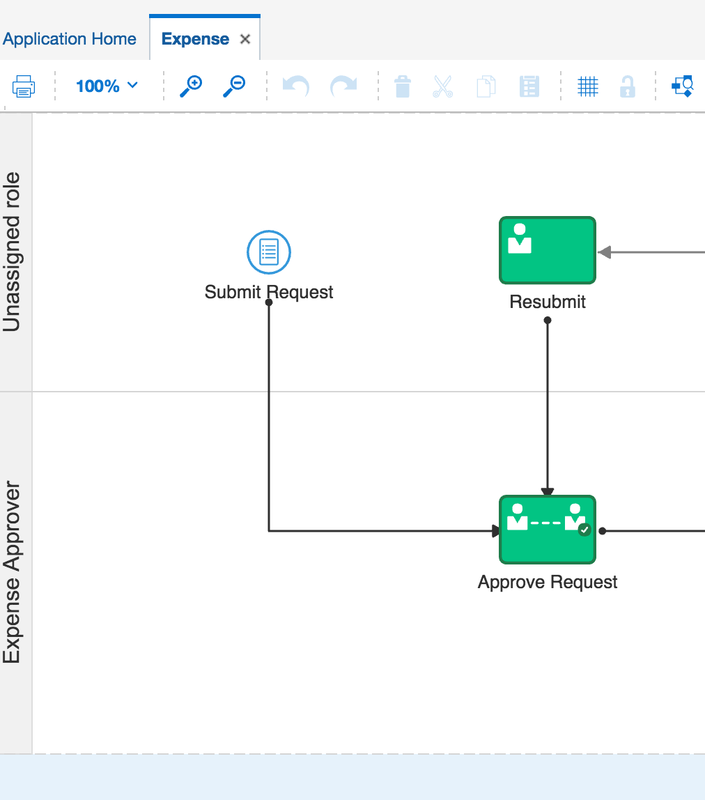 This role gives access to process activity, but process reviewers can not take actions on tasks or alter tasks flows. Process reviewers are not participating but typically responsible for reporting on current process instance status. Analytics Viewer. assigned this role can create and view business analytics dashboards associated with the specified application. Expense Approver. The manager of the employee that approves the expense items on the expense report. You can edit the swimlane by clicking on the pencil icon next to the swimlane and select a role. I did not see the role I was looking for in the list, but that is not a problem: I can add an Application Role to the list by clicking the "+" icon. So far so good. I added a role "Expenser" and assigned the first swimlane to it. 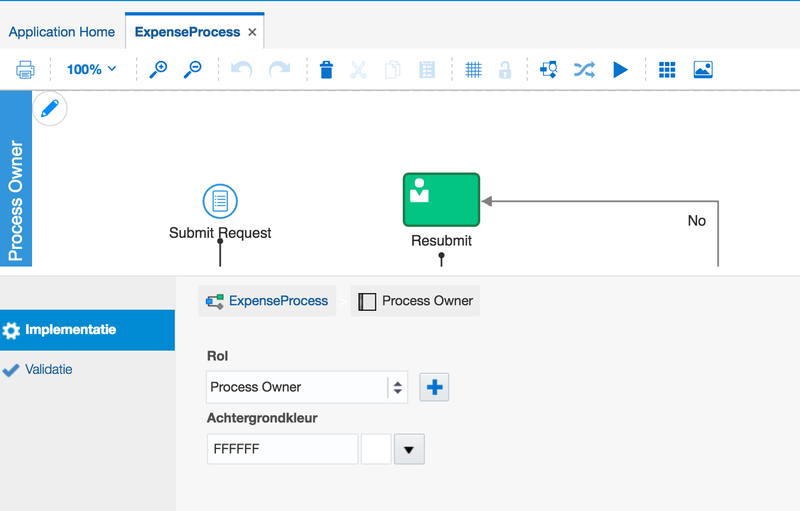 Then I did the same for the second swimlane: I edited the swimlane and added a new role "Expense Approver". I wanted to call the first swimlane/role "Expense Submitter", remember? I accidentally named it "Expenser". I want to change this name, because I don't like it. My first attempt is in the current screen. I have the pencil next to the swimlane, so probably I can edit the role here, right? Wrong. It will bring me back to assigning a role to a swimlane. I can assign it to a different role or a new role. But not edit it. So let's look at another option, there is another place to manage roles, on an application level. Click on the tab "Application Home". This will bring you back to the Application Home. When you click on the "Organisation" link, you will get a pop-up that allows you to delete or add roles. However, you can't edit roles. Because I really wanted a new name, I deleted the role and added a new one. Remember, adding a role will not only impact the swimlane, but also adds an application role for the application. This role will be available for all processes in this application. Of course this makes you wonder what happened with the swimlane that was using the role we just deleted? It results in a swimlane with a 'Unassigned role'. So I assigned the newly created role and continued with implementing the process. Buttons versus links. Why is 'Organization' a link, not a button at the right hand side of the Application Home? Why is closing the application implemented with a link and not a button? There are multiple levels of navigation, and it is not always clear why which pattern is used for what level. Moving from the Workspace to the Process Composer. It is unclear to me how to get back to the workspace once you have entered the process composer, apart from saving the link as a favorite in your browser. Some concepts are translated, some are not. Consistency. It seems that in the Dutch version, a project role is edited (see illustration), in the English version the dialog is called "edit Application roles" (the correct concept) . It is not possible to edit the name of the role. You have to delete it and then add a new role. This will result in swimlanes with unassigned roles in existing processes. By default the submitter of a form is defined as the process owner. In most cases this will not be the case: the receiver of the form is typically the process owner, who will approve or deny the request and has the ability to change the process etc. This is not an extensive list, but just the issues I ran into while trying to change the name of a process role after having created a process based on a pattern. From a functionality perspective PCS is becoming more and more powerful. However, it is very important to keep the User Experience that comes with the functionality consistent within itself and with the other Oracle products as well. Including the Oracle Applications. Because for users, the difference between PaaS and SaaS is inconsequential, they just use the tools. In the end, to users it does not matter whether Oracle calls these tools a 'Platform' or 'Software'. What matters is that they are productive and that the tools are easy to understand.